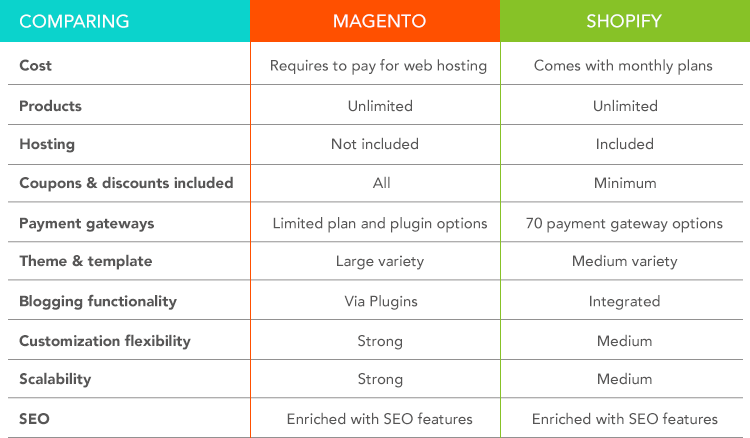 Having a tough time to decide which platform to select between Magento and Shopify for your business in 2019? While choosing the best platform for your business, you can’t rely on a “leap of faith”. Though Magento and Shopify are the two most popular ecommerce development platforms, however, thorough research is extremely important. Let’s start with a head-to-head comparison between these two platforms. Magento users need to learn some code and technical terms to escalate the platform’s full potential. It demands coding proficiency irrespective of freedom and flexibility. It comes with a big community of support for users. Its forum is huge and if the developers face any trouble, the community will help with an answer to get you online as quickly as possible. The huge database of user-generated content offers comprehensive, easy to understand explanation for different queries. But there’s no 24/7 phone support in the community edition. Great for the non-technical users, Shopify comes with an intuitive interface which is quick and easy to use. It is a one-stop-platform with drag and drop website building option. This means you can easily customize your ecommerce store by moving elements around the website as per your choice. Being a commercial product, it offers all the tools that you need to create your store online. From a report by BusinessWire, in 2017 there were around 1.2 million people who were actively using the Shopify backend platform. With Shopify, you can use wizard mode that easily adds custom images to your store to offer a more personalized touch. You can quickly add products to start selling them. Addition to that, there are 24/7 phone support, live chat and email functionality in case you do run into trouble. Both the platforms offer strong customization capabilities that allow editing the raw HTML/CSS code directly. This allows the total control over the design and look of your e-store. However, there are some differences. Magento comes with 12 themes, out of it 10 are fully responsive design. Its premium themes start from $1 only. As working with Magento requires coding, you can create your own theme from scratch. It is a very flexible platform that offers you complete freedom and let you choose ready to use premium themes as well. Though it is relatively easy to install and modify, it is a little pricey in the short-term. Both the platforms have Inventory importing, categorizing and filtering options with product and pricing variations. Magento undoubtedly is made for different sized online stores. It works great even when it comes to advanced features. It allows unlimited products to upload and built-in API helps in connecting third-party for joining a broader distribution network. Shopify is not made for large online stores because of its restrictions. But it brings a simple and straightforward interface where you can control your inventories. It also comes with Oberlo as an embedded app which allows dropshipping. With a whopping 5000+ apps & add-ons, Magento offers complex ecommerce extensions that can be integrated evenly with the Magento backend. These apps and add-ons can enhance the functionalities of your ecommerce store without writing new codes. Shopify offers 2400+ free and paid apps to select from. It comes with a simpler installation process to help the functionalities of your store. Magento comes with multi-lingual payment processors which will help your store across borders. The various modules and setting up different payment options on Magento can be added to your store via third-party add-ons. This platform comes with an integrated payment processor. Besides, it supports over 70 different payment processors. Did you know according to a report by the European Commission, 42% of the online buyers said they never purchase products or services if the information is in other languages? We can say this factor is crucial to consider when you are focusing on the international marketplace. Your ecommerce website development should come with all the possible options for future expansion and language is one vital thing. Magento offers inbuilt multilingual capabilities. More languages mean fewer hurdles your visitors meet that leads to more sales for your business. Shopify has a disadvantage here as it doesn’t offer inbuilt multi-lingual capabilities directly. However, you can get support from third-party or paid apps. Finding the right eCommerce platform is a challenge, it all depends on your business strategy. Generally, it is seen that small businesses are more inclined towards Shopify when it comes to e-commerce website development. That’s because being a hosted and fully managed service it offers greater ease of use. When it comes to Magento, the general perception is that it is most preferred by medium and large-sized store. But to your surprise, it is a “fits all” platform for any business that is preparing for effortless scalability in the future. It is a robust platform which will make your website ready for the global market. 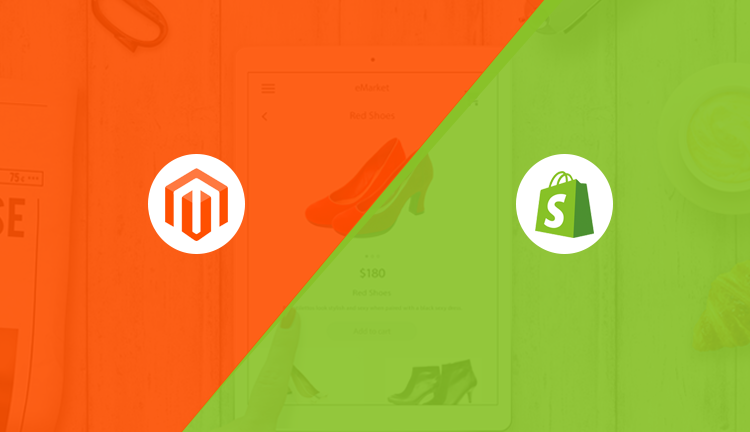 If you’re a techie and wish to offer a whole well-done shopping experience then go for Magento. In short, Magento is ready to offer you the best ROI and growth rates compared to other platforms. If you’re planning to develop your own ecommerce store, Sphinx Solutions can help you in each step.